Brass is an alloy of copper and zinc. It is strong and durable. 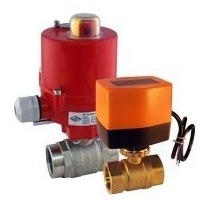 Brass electric ball valves are used with e.g. (slightly dirty) water, (compressed) air, vacuum (max. -0.9 bar), oils and fuels. Brass is not suitable for chloride solutions (such as sea water, demineralised water, swimming pools).